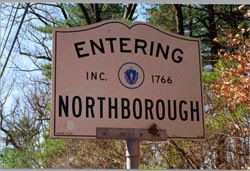 Route 20 Coast to Coast: Boston to Northborough cont. At 29.4 m. is a marker giving directions for a five minute walk to the Monument and Grave of Mary Goodnow. On August 18, 1707, Mary Goodnow and a friend, Mrs. Fay, left the garrison to gather herbs near Stirrup Brook. They were surprised by a small band of Indians; Mary, who was lame, was caught in flight, slain, and scalped, her body being left beside the path. Northborough, 31.7 m. (pop 2396, sett. about 1672), is a town that was once part of Marlborough. Market gardening and fruit raising are carried on extensively in the area. In 1884 teeth and other remains of a hige animal were uncovered in the lower part of town; these were identified as those of a mastodon and are now in the Museum of the Worcester Natual History Society. West of the town hall on Church St. is the triangular Green, on which is the Old Congregational Church (1808) with a bell from the Paul Revere foundry... Behind the church is the Old Cemetery, opened in 1750, containing the grave of Rabbi Judah Monis (1683-1764), for 40 years Professor of Hebrew at Harvard and one of the first prominent Orthodox Jews to embrace Christianity in North America. US 20 runs through a prosporous country of poultry farms, market-gardens, and fruit orchards as neat and gaily colored as a patchwork quilt.